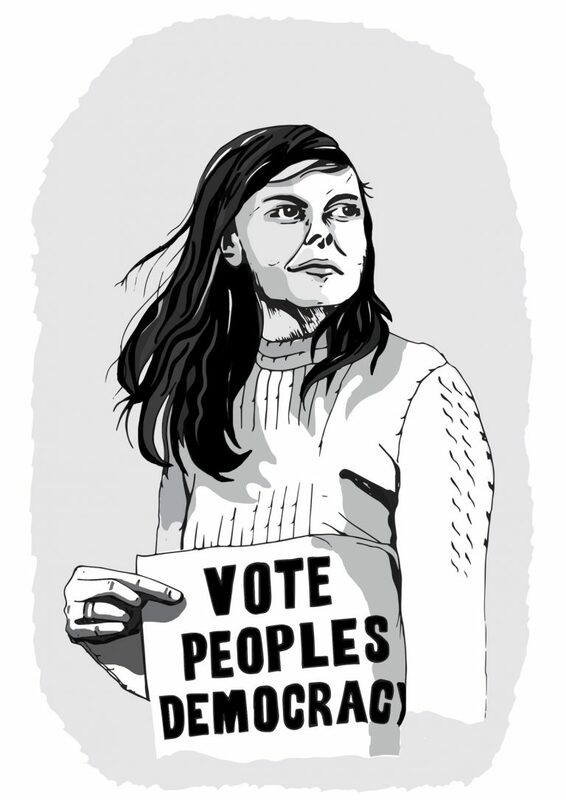 Bernadette Devlin, a radical feminist and Catholic activist in Northern Ireland, was a founder of People’s Democracy. After one failed attempt to be elected, she became the youngest woman ever elected to Parliament in 1969, running as a socialist. When Bernadette Devlin was eighteen, her mother died, and Devlin helped care for the other children while finishing college. She became active in politics at Queen’s University, founding a “non-partisan, non-political organization based on the simple belief that everyone should have the right to a decent life.” The group worked for economic opportunity, especially in job and housing opportunity, and drew members from different religious faiths and backgrounds. Devlin then traveled to the United States and met with the Secretary General of the United Nations. She was given the keys to the city of New York — and handed them over to the Black Panther Party. Devlin married Michael McAliskey in 1973 and lost her seat in Parliament in 1974. They were among the founders of the Irish Republican Socialist Party in 1974. Devlin ran unsuccessfully in later years for the European Parliament and the Irish legislature, the Dail Eireann. In 1980, she led marches in Northern Ireland and in the Republic of Ireland, in support of IRA hunger strikers and opposing the conditions under which the strike was settled. In 1981, members of the the Unionist Ulster Defense Association attempted to assassinate the McAliskeys and they were seriously injured in the attack, despite British Army protection of their home. The attackers were convicted and sentenced to prison for life. In more recent years, Devlin was in the news for her support for gays and lesbians who wanted to march in New York’s Saint Patrick’s Day Parade. In 2003, she was barred from entering the United States and deported on grounds of posing a “serious threat to the security of the United States,” though she had been permitted entry many other times.